I wrote a review on Dr. Brittany Henderson’s first book What You Must Know About Hashimoto’s Disease, and have since also been granted permission to share an excerpt from it, in order to give Hashimoto’s patients even more of an idea of whether it could help them. In my review, I mentioned how Dr. Henderson’s approach is very compassionate and non-overwhelming, and I hope the below helps to demonstrate this further. I didn’t know I would become a thyroid doctor until my second year of medical residency. It was one morning after a long shift of overnight call. I was about to rush home to catch a few hours of desperately needed sleep, when I received an invitation to work that afternoon with a local endocrinologist who had a strong interest in thyroid disease. Something innate in me led me to proceed toward the endocrinologist’s office. Once at the office, the attending doctor and I entered a dimly lit procedure room. A young woman sat cross-legged on the table, looking at us with tears in her eyes. “Thank you. You changed my life,” she said to the attending doctor. He did? But how? I would later learn that she had been struggling for years with symptoms of the most common thyroid disease: Hashimoto’s. I would learn that many people, millions in fact, were struggling with the very same disease. Millions more suffered from other thyroid disorders and thyroid cancer. That day, seeing the effect on that patient’s life, I knew what my calling was. I love being a thyroid doctor. It’s not just my job or my career; it’s my passion. I have personally witnessed people get better, many people. I’ve seen the initial looks of despair and desperation; I’ve listened through the tears; I’ve given countless hugs and words of encouragement. And I’ve also witnessed many of those same patients reclaim their lives, enjoy renewed work success and satisfaction, and regain their sense of joy. By combining my clinical knowledge with caring guidance, I have helped numerous patients overcome their life-altering thyroid-related illness. And I want to help you, too. I am an endocrinologist and medical doctor by training. I am not the stereotypical uncaring thyroid doctor you have read about in the online blogs and self-help books. I’m not close-minded about the treatment of thyroid disease, and I believe there are multiple effective strategies for treatment. would like to provide to you. For the past ten years, I have been working alongside patients to help them achieve their best thyroid health. Over those years, I have seen many patients in second, third, or fourth consultations for uncontrolled hypothyroidism, Hashimoto’s disease, Grave’s disease, thyroid nodules, and thyroid cancer. A recent study done by the American Thyroid Association (ATA) found that over 45 percent of people changed thyroid doctors at least once, with 12 percent changing physicians up to ten times because they felt they were not receiving the care they needed. As a medical doctor, I find this completely unacceptable. I understand the desperation in seeking out someone, anyone, who will listen and attempt to treat such a life-altering disease. Many patients come to me confused about what’s wrong with them or, once they have a diagnosis about what they should be eating and how they should be treated. With all the information out there, it can get overwhelming and confusing. With this book, we will lay out a way forward for you. There is a way through, and although it isn’t easy or simple, it is possible. You can feel better than you do now, and this book will help you get there. I was used to feeling sick. For years, I’d dealt with a multitude of chronic health issues, which took an enormous toll on my body and spirit. I spent years seeking answers and help. My medical conditions took a long time to diagnose, and had me going from doctor to doctor in search of assistance. What I found, more often than not, was indifference and doubt. Along the way, I was ignored, insulted, and dismissed by more doctors than I can count. I was told I might have multiple sclerosis, lupus, or cancer. Other times, doctors implied that I was crazy, depressed, or just a complainer. What I was and what I still am is a person dealing with chronic health issues. The impact on my life has been transformative. It’s been frustrating and exhausting. The worst part of dealing with chronic illness is the uncertainty and unpredictability of daily life, not knowing from day to day, or even hour to hour how I would feel. There has not been one aspect of my life left unaffected by my health struggles, either professionally or personally. Like you, I know what it’s like to deal with the exasperating search for medical help while struggling with illness. At times I’ve felt discouraged and struggled for hope. Autoimmune illness ebbs and flows, characterized by flare-ups and more dormant periods. And flare-ups of one problem usually lead to a ripple effect. Since this has been my experience for years, it wasn’t totally unfamiliar to me when I discovered I had a new illness to contend with: Hashimoto’s disease. Getting to that diagnosis took time and perseverance. I soon realized that not all endocrinologists are thyroid experts. I searched for someone who focused on thyroid issues, and that’s when I found Dr. Henderson. She was the one to diagnose me with Hashimoto’s. And while it was clear to me at our very first meeting that she had an enormous scope of knowledge, it was also clear that this was a complex condition that was not easy to understand. As I did with every other medical issue, I approached Hashimoto’s as a seeker of information. Frustratingly, the multifaceted elements of this complicated illness proved too much for me to wrap my brain around. In my quest to better digest all the related components of thyroid disease, I spent countless hours online and read several books. I emailed Dr. Henderson with questions and follow-ups. She patiently and compassionately answered me, but I knew that I needed a more comprehensive understanding. I realized that if I had questions, concerns, and frustrations, endless other Hashimoto’s patients must have similar experiences. I needed help, they needed help. . . we needed help! 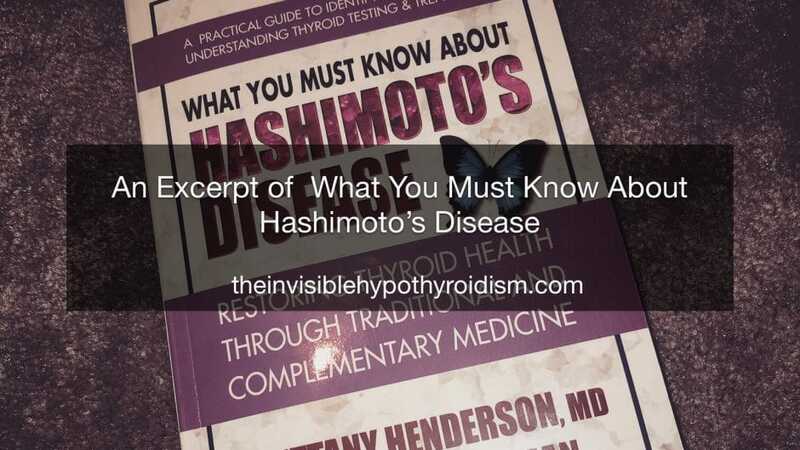 So, as a real-life physician and patient team, Dr. Henderson and I decided to compile the most important, up-to-date information necessary for Hashimoto’s patients along all parts of their thyroid journeys. This book was written with you in mind. Please know that we understand and want to help. We don’t profess to have magic bullets or miracle cures, because despite what you might have heard, no such thing exists. But we have much to share with you that will hopefully make a positive difference in your life. When you’re done reading this, you’ll be armed with accurate information, sound advice, and actionable recommendations. Working on this book, as is the case with any of my writing, has been difficult at times. It’s a challenge to use your brain and body when you have chronic medical issues. There were times I had to write from bed. I say this not to be discouraging or negative in any way, but to let you know that even when we, as patients, must make adjustments because of our situations, it’s worth it. While having a lifelong autoimmune illness may cause us to feel less than our best, at times we can find solace in having fuller command of our condition. Knowledge is power, and gives us greater control over our bodies and our lives. As you may have already discovered, your health and well-being can be profoundly affected by a butterfly-shaped gland that is the size of a walnut and located at the front of the neck. “But how?” you may ask. The answer is through the production of hormones, or signals that travel from the thyroid to the rest of the body through the bloodstream. When working normally, the thyroid gland can keep the body functioning in peace and harmony—but when not functioning normally, the thyroid can have a devastating impact on your health. Hashimoto’s thyroiditis is the most common thyroid disorder, affect- ing 14 million people in the United States alone. Simply put, Hashimoto’s is the underproduction of thyroid hormone, leading to the development of hypothyroidism. But the larger impact of this disease stems from it being an autoimmune disorder. In addition to causing hypothyroidism, Hashimoto’s refers to a situation in which the immune system attacks the body, resulting in life-changing effects on your health. Maybe you or someone you care about has recently been diagnosed with Hashimoto’s. Or perhaps you’ve been struggling with it for years, still unable to find the help and relief you need. Possibly you suspect you may have Hashimoto’s based on symptoms and your own research, but haven’t been officially diagnosed yet. Our hope is that this book will concisely and accurately give you the information you need to help understand and be proactive about this specific thyroid condition. Hashimoto’s can be debilitating, and sufferers need to know how to be an active participant in their own care. In order to understand your Hashimoto’s symptoms (fatigue, muscle pain, weight gain, headaches, throat pain, difficulty concentrating, skin issues, and constipation, among others), you need to understand as much as possible about this complex disease. Once you do, you can then be an advocate for your own thyroid health—which will lead to better overall health. This book will give you the information you need to know about Hashimoto’s, from diagnosis to treatment. There is a multitude of books and websites out there about thyroid disease, offering different perspectives and advice. In fact, there’s so much information out there that it may overwhelm you. In your quest for knowledge, you may find yourself reading contradictory information, creating confusion and frustration. Even worse, you may be embarking on your fact-finding mission while you feel depleted from struggling from the effects of thyroid disease. There are so many opposing viewpoints, nutritional supplements, and diets, that you could try all of them and still never exhaust the possibilities. That is where we come in. You need one central place for clarity and guidance, and this is it. You and others like you are the reason we wrote this book. As a physician and real-life patient, we have joined together to provide a place for thyroid patients to turn for answers. The information you’ll find here is grounded in both evidenced-based medicine (related to research findings) and clinical experience (based on treating thousands of patients). Our collaboration brings a uniquely valuable combination of a knowledgeable thyroid specialist and a patient who has been where you are. There is no one-size-fits-all approach to thyroid disease, and that’s because Hashimoto’s is a multifaceted illness. The more you know, the greater impact you can have in reaching your personal best health. You need facts and a plan. That’s what this book is here to do. We will guide you, step-by-step, along your journey to better thyroid health. We’ve written this book in a way that breaks down complicated medical issues into understandable concepts that will enable you to navigate the complex world of Hashimoto’s. The book is divided into three sections. Part 1 covers thyroid basics and is your introduction to why the thyroid is so important to your overall health. After reading Part 1, you will have a firm understanding of what autoimmune disease is and how it can affect the thyroid gland in particular. We will also discuss thyroid nodules and thyroid cancer, two concurrent diseases that are more likely to occur in patients with Hashimoto’s disease. Part 2 is designed to explain the world of testing and diagnosis that lies ahead, which is of critical importance in Hashimoto’s disease. We will discuss available thyroid blood tests and how they can be used to optimize your thyroid health, along with a variety of other important tests that can help to establish or confirm a diagnosis and yield pertinent information about your specific situation. We also walk you through the biopsy process and introduce you to the emerging area of molecular testing. The last section of the book is all about Hashimoto’s treatment and management. Here, we will provide extensive information about treatment, including thyroid hormone replacement options, integrative approaches, diets, supplements, and avoiding environmental exposures. We will pro- vide useful tips on how to achieve optimal thyroid levels and suggest ways to avoid flare-ups. Finally, we will offer recommendations on credible resources where you can find a qualified thyroid specialist or supportive community of fellow patients who have already achieved success. Our goal is to help you be an advocate and active participant in your own healthcare. While we can’t say the process will be quick or easy, it will be worth it. Just know that many thyroid patients have been where you are today. Sick. Exhausted. Scared. Maybe even hopeless. But hang in there, because you aren’t alone in this. There is help. And most importantly, there is hope. You can find my written review here and find it on Amazon below. Next Could a Thyroid Supplement Help Your Symptoms?